Don't worry about a bottle. The Fast Pack becomes your cup. 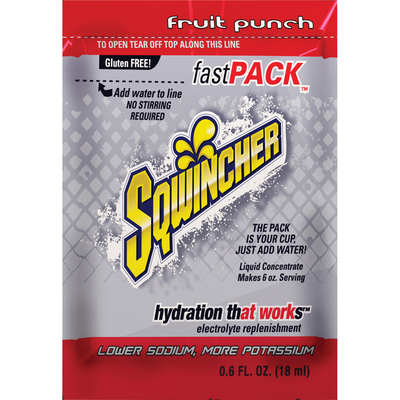 Just add water to the pouch for full hydration and electrolyte-rich health benefits. Each tamper-evident pack contains one single serving. Electrolyte-replacement powder mix is designed to restore important mineral salts and fluids lost through dehydration, physical exertion and heat stress. It absorbs quickly and restores the body to its proper electrolyte and fluid balance. This powder is high in potassium and low in sodium and contains no calories, caffeine or sugar.